This stunning motor yacht immediately impresses by her size and her harmonious lines. Paradis very quickly established a reputation as one of the most successful Greek charter yachts. From the moment you step on board, the luxurious and bright saloon will cast a spell on you. 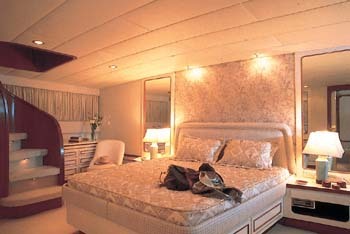 Wade into the staterooms and feel the warmth. Totally refurbished in 1997, PARADIS boasts a fresh and modern interior. Paradis is mastered by a very dedicated captain and crew. 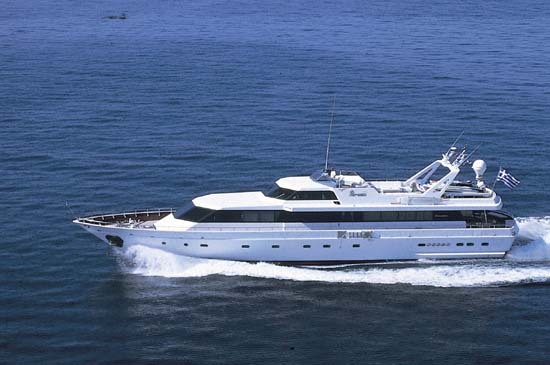 They provide the key element in the success of your charter. 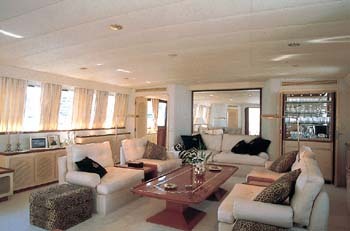 ACCOMMODATION : Ideally for eleven guests in six staterooms, but can take up to sixteen if required. One two-level master suite forward, with study on main deck and bedroom below with tub in the bathroom and a walk-in closet. 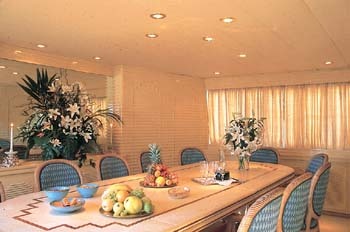 Amidships on the lower deck, two double staterooms and two twin staterooms with shower rooms in the bathrooms. The two twins have two additional pullman berths each. One single stateroom aft with shower room, that has one additional pullman berth.Crew in separate quarters.